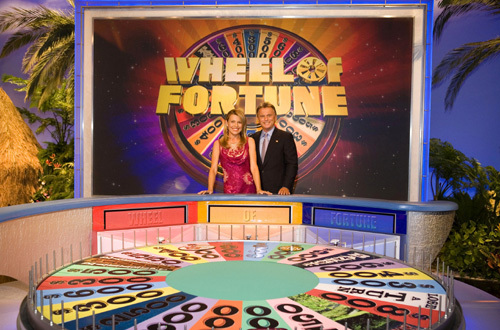 Today the Wheel of Fortune fan nation was treated to a long-awaited announcement that the show would be renewed for another season. [WARNING: Spoilers ahead from season 32!] Anyone who is caught up knows that the excitement over the win of contestant Judy Williams, 35, an insurance agent married to her “amazing” husband Mark with whom she has two “wonderful” children, was rather short-lived. Viewers are likely still licking the wounds from that shocking last episode in which contestant David Hiffts, 27, a storm chaser married to his “lovely” wife Linda with whom he has two “wonderful” children, guessed the letter “I” rather than a “U” to complete the word “Fabulous” in spite of a very promising solving streak and presenting himself to be a reasonably intelligent person. Co-host Pat Sajak took to Twitter after the episode aired to weigh in on the controversial twist, saying, “Just when I think I know where it’s going, I’m reminded that I don’t. None of us do. This is the nature of Wheel of Fortune.” Even with the crushing ending where Hiffts went on to lose his paid trip to Mount Rushmore, executives are confident Wheel’s audience will return to watch what happens next. “We’ve got some big stuff to look forward to. Longer phrases, even more vague clues, some fun new set decorations, all new contestants with backstories revolving around significant others and children,… without giving too much away, I’ll just say our fans are in for something S-P-E-C-I-A-L,” says Rob Roman, a producer who also writes and coordinates most of the puzzles. Producers also promise that the show will revisit Hawaii for the seventh time, but don’t think this familiar location won’t be without fresh surprises. “Vanna MIGHT wear a dress or two that’s actually a top with flowy pants just made to look like a dress, at least that’s what I’m being told,” says longtime fan favorite co-host Vanna White. Tags: game, gameshow, letters, money, puzzle, show, tv, vanna white, wheel of fortune. Bookmark the permalink.